The use of Folder is to organize Files in place. So, creating a new folder is one of the most frequent task in Windows. Although mouse has been introduced to make computer usage more lively, Keyboard Shortcut or Hotkey Combination are still frequently used for quicken many jobs. New Folder can be easily created on any Windows version by right clicking on any empty space in explorer and clicking on New > Folder. But it is always desirable to have it done with a Hotkey or Keyboard Shortcut. Before Windows 7, that could be done only by using third party software but Windows 7 have an inbuilt Hotkey for performing the job. Open any Explorer window, viz. Desktop, Documents, Downloads etc. 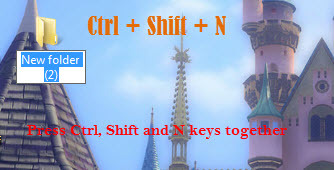 Press Ctrl, Shift and N keys together [Ctrl + Shift + N]. You will see that a New Folder has been created. Rename it & use for organizing your documents. This entry was posted in Tips, Windows.